Unexpectedly, I got offered the opportunity to do something that I had been dreaming of for the last few years: becoming the Editor-in-Chief of my university’s paper. I first became involved in this career field in my sophomore year of high school as a staff member of my high school’s yearbook. It wasn’t long before I became an editor there. During my senior project, I knew that it was time to set my sights on greater goals. During an interview about the day in the life of journalists, I spoke to Lil Mirando, editor of Hammond’s Daily Star. She asked me why I wanted to be a journalist. I coyly said, “I have a story that needs to be told.” She politely corrected me and said that the best journalists tell the stories of those without a voice. Ironically, after writing for that paper, I came to my first communication class and met Dr. Joe Mirando, Lil’s husband and one of my mentors who has pushed me from the very first day I stepped foot in his class. I said all of that to say that there’s no such thing as being given the position of Editor-in-Chief. I believe that I have earned this opportunity. You work day in and day out in the beginning to earn the position. Later on, you find out how hard you have to work in order to maintain it and carry on your legacy after you’ve left. I hope to inform the campus, local and even national community about who we are as a university and staff. Any news organization can cover events, but I believe that our asset lies in building a personal connection with readers. I hope that the paper will improve as far as layout, diversity, accuracy, organization, content and overall quality. However, the biggest change that I hope to accomplish is not visual but emotional. I hope that whether readers know everything about the university or absolutely nothing, our articles, especially features, register a connection with readers and intrigue them. In the office, I have the support of Director Dr. Lee E. Lind, Coordinator Lorraine Peppo, Administrative Assistant April Assavedo and my amazing staff. Outside of the office, I have two supportive parents, friends, educators, Press Club members and fellow communication students that I know will cheer me on from the sidelines. Dr. Eric Summers and other administrators on campus have been very supportive of my new role and the paper as a whole for the five semesters that I have been on staff. 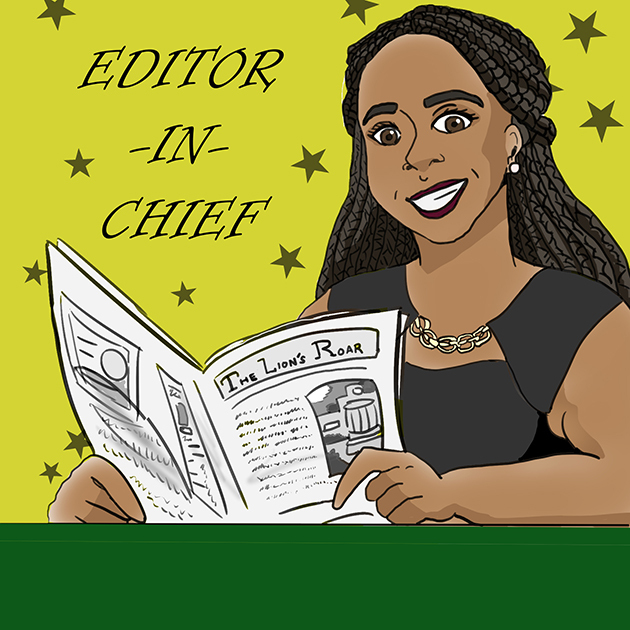 I’ve had the amazing opportunity to work under four Editor-in-Chiefs as well as a slew of other section editors and senior reporters that have taught me how to be a better journalist and person. I hope to do the same thing for new reporters as a positive leader with great expectations. I’ve witnessed many examples of success and some errors from the past editors and how they handled them with grace and dignity. I can only hope I leave behind a legacy as half as great that I will be proud of.